Resources > articles > What is Product Management? One reason the “What is product management?” question comes up so often, even from experienced businesspeople, is that product management encompasses a wide-ranging area of responsibilities. Indeed, the role itself typically means very different things in different organizations. Here is the most succinct response we’ve come up with for the “What is product management?” question: Product management is the practice of strategically driving the development, market launch, and continual support and improvement of a company’s products. Of course, that is a highly abstract explanation of the role. So what is product management? What does the job actually entail? 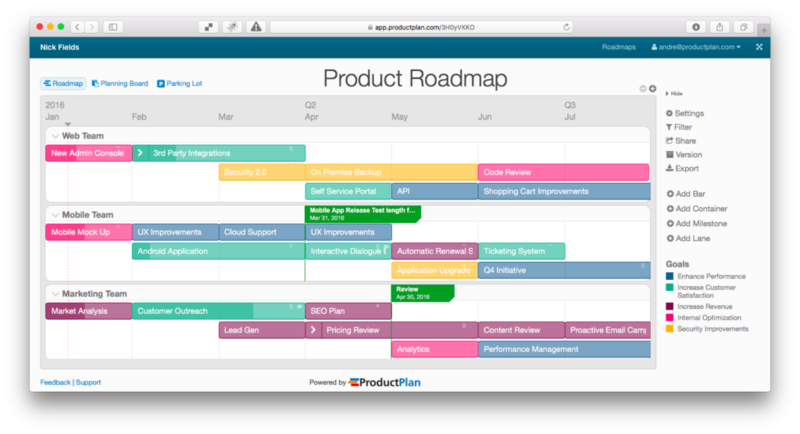 An example of a product roadmap that a product manager may use to communicate their strategy to stakeholders. The day-to-day tasks of product management professionals can include a wide variety of strategic and tactical duties. Most product managers or product owners do not take on all of these responsibilities. Indeed, in most companies, at least some of them are owned by other teams or departments. Conducting Research: Product management professionals (product managers, product owners) conduct research to gain expertise about the company’s market, user personas, and competitors. Developing Strategy: When they’ve gained sufficient industry information, product professionals then shape this knowledge into a high-level strategic plan for their product—including goals and objectives, a broad-strokes overview of the product itself, and maybe a rough timeline. Communicating Plans: Now that they have a working strategic plan—which they’ll typically develop using a product roadmap—product professionals then present this plan to key stakeholders across their organization: executives, investors, their development team, etc. These product professionals will need to continue communicating across their cross-functional teams throughout the development process and beyond. Coordinating Development: Assuming they have received a green light to move forward with their product’s strategic plan, product professionals will then coordinate with the relevant teams—product marketing, development, etc.—to begin executing the plan. Acting on Feedback and Data Analysis: Finally, after the product has been built, tested and introduced to the marketplace, the product professional will learn, both through data analysis and by soliciting direct feedback from users, what works, what doesn’t, and what to add. Then they will again work with the relevant teams to incorporate this feedback into future iterations of the product. One area of responsibility that people often assume belongs to product management—but, in an ideal business environment, shouldn’t—is managing the day-to-day details of a product’s development. As we describe on our Product Management vs. Project Management page, this is the role of a project manager. They’re also responsible for communicating product objectives and plans to the rest of the company. They need to ensure anyone involved with any aspect of the product is working toward a shared organizational goal. Product management encompasses a large set of ongoing strategic responsibilities. So, a product manager shouldn’t be responsible for the ground-level details of the development process. These tactical elements could include tracking each specific item being built, monitoring the respective workloads of each developer, or checking up on the progress of each piece of sales collateral. This is why smart organizations separate this function out and assign it to the more tactically focused project manager, leaving the product manager free to focus on the higher-level strategy. Ultimately, our answer to the “What is Product Management?” question is that the role is all about strategy. Product managers develop the product’s strategy and persuasively communicate that strategy. Then they ensure all decisions with regard to development, marketing, etc., reflect and support the strategy. If you are interested in what makes an effective successful product management professional, read the “Five Traits a Successful Product Manager Needs” section on our What is a Product Manager’s Job? page.